my life is crazy. 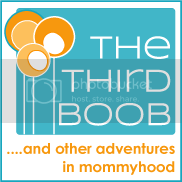 most days with five kids, i feel like i'm barely treading water, let alone setting any speed records. a few years ago....i somehow (through a moment of weakness) decided we needed to add pets to our already crazy equation. 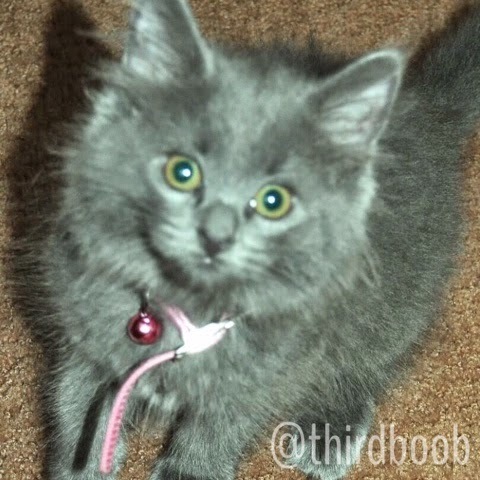 a friend of ours was fostering some of the cutest little hair ball kittens you ever have seen. one look at those little puffs of fur with eyes and i was a goner. the miracle really occurred when my husband actually agreed to take on the fur babies. he's pretty hard hearted when it comes to adding more responsibility to our already insane lives so our cats have no idea how fortunate they are that they are a part of our family. these little furry creatures are, happily, a part of our lives. i am probably the luckiest pet owner on the planet because they are two of the easiest animals ever. they love cuddling with my kids, they get their drinking water from the faucet and they eat out of one enormous dog food bowl that we keep perpetually stocked with an over abundance of cat food. honestly, if they were any easier, i think i wouldn't even know they were here. i have to do very little to look after them (now...my husband has kitty litter duty so he might have a slightly different story.) other than the happy job of petting them when they are nearby and vacuum up their ridiculous amounts of fur (yes, hair ball kittens make hair ball cats...just fyi), i do very little to take care of my cats. let's face it, my fifth born child has to pretty much fend for himself. he gets his own snacks, pees on occasion in the backyard, and has to tell me when he is tired. if he has to do all of that, then these poor kitties have had to learn really early on that they were essentially the sixth and seventh born in this family. they have to make their needs known to me. even then, i squeeze in most of the cat attention when i'm in bed for the night and can finally sit still for a few minutes. i feel bad that i cannot devote more time to my fur babies but there is only so much of me to go around. when rachael ray introduced the new zero grain whitefish dry cat food, i thought, "well, at least i can feed them well." 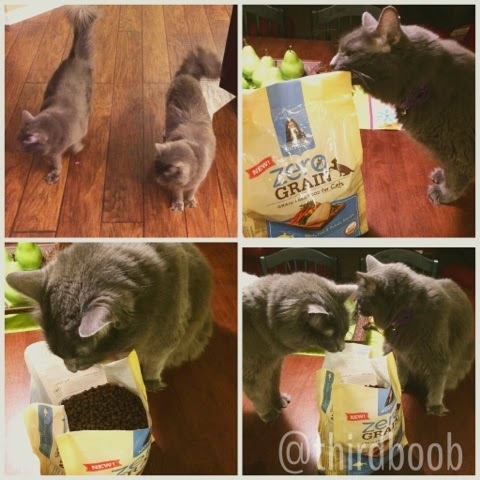 we have been big nutrish cat food lovers for over a year now. my cats are happy and healthy and they run when they hear a new bag being opened. 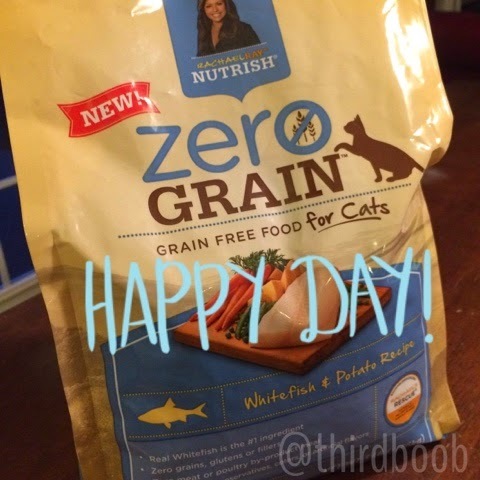 i don't know if my cats noticed the difference between their previous nutrish cat food and the new zero grain cat food but i felt good knowing that they were getting the best in quality ingredients in their food. 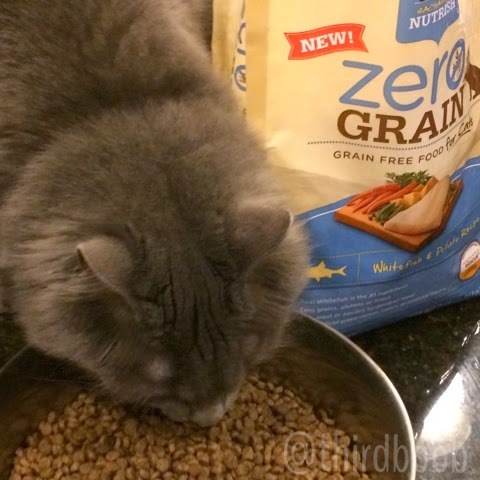 zero grain cat food has no grains, glutens or fillers...it's like the gluten free diet for your pets. i am very fortunate that my cats are tolerant of grains in their food but i know of many other pet owners who have to adhere to a strict diet where their pets are concerned and this cat food is exactly what their cats have needed. while we may not medically need zero grain cat food, we know that it is a healthy option for our cats, even without dietary restrictions. i also love looking at the ingredient listed in the nutrish zero grain cat food and knowing that my cats are getting whole, pure ingredients that i would enjoy eating myself. real whitefish is the #1 ingredient. whitefish is a tasty and highly digestible protein that helps to maintain strong muscles and helps minimize litter box odors. now, i've already mentioned that i don't do the littler box...that's my husband's domain. (i frankly have dealt with enough of my kid's poop to last more than one lifetime....my husband can have the kitty poop!) still, i don't want to live in a house with a stinky litter box so "all hail the whitefish!" it also has zero meat or poultry by-product meal and zero artificial preservatives, colors or flavors. i can feel good about that! i'm going to be honest. there is not enough of me to go around and i often feel guilty that i'm not able to spread myself around more to my children. 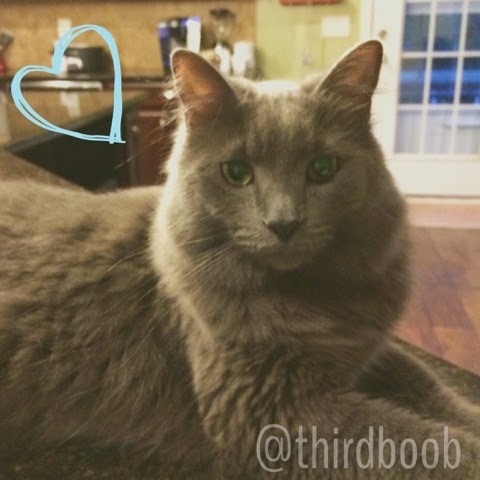 when i add my little cats to the mix, i just heap on pet owner guilt on top of it all. all i can do is my best and trust that everyone, including my cats, will turn out all right. the fur babies seem very happy and i like knowing that, while i may not be able to dote on them as much as i would like to, i can give them the best food i can find and the most attention i am able to give. the great thing is that they don't seem to mind my shortcomings and their love is unconditional. that alone brings me joy and encourages me to keep giving in whatever ways i can because it is always worthwhile. in 2007, with help from pet nutrition experts, rachael ray created *nutrish* ultra-premium food and treats for dogs. 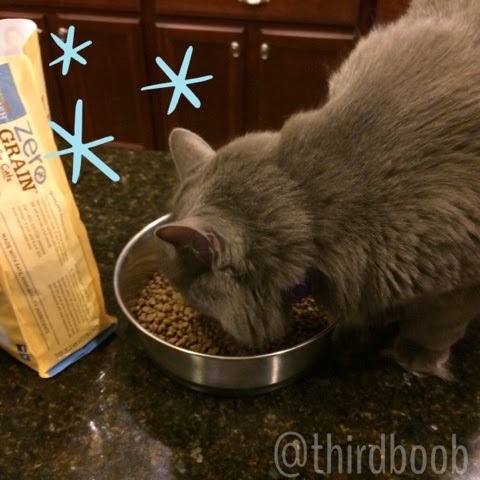 in 2014, they grew the brand into the world of cat food. whether intended for dogs or cats, nutrish recipes are made with simple natural ingredients and do not contain meat or poultry by-product meal or fillers. real meat is the #1 ingredient in their cat food and all recipes were inspired by rachael’s kitchen. beyond just the amazing ingredients in nutrish, we love that rachael's personal proceeds go to *rachael’s rescue*, created to help shelter pets. as of today, over $9 million has gone toward food, medical supplies and treatments for animals in need. 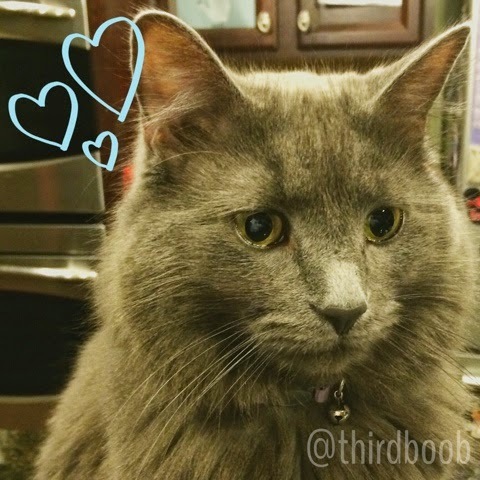 my own sweet cats are rescue cats so this project holds a special place in our hearts. their products are also extremely easy to find in stores like target, walmart and amazon. i frequent those stores several times a week, truly, so this makes shopping for my cat's needs that much more simple. if you haven't tried nutrish for your pet, consider making the switch today. you won't regret it. also, please take a moment to follow rachael ray's nutrish on each of these social media outlets to hear all of the newest developments with the pet food line and *rachael's rescue*.